Oh my! I have not been so knackered for a long time (equivalent to about 3 x 14 hours shift in the hospital I think)! The 2-day Future Music Festival Asia partying has really worn me out but I’ve never had so much fun. Will blog about it soon. It’s funny how the first time I’ve eaten Roti Jala was all the way in Melbourne (a big shout out to a dear friend, Robert of Chili Padi for great authentic Malaysian food). True enough, growing up in Sarawak, it’s very rare that we visit anything other than Chinese Restaurants, except for the occasional Roti Canai when the craving strikes. To be honest I don’t even know if we can find Roti Jala in Bintulu, as it originates from Johor, a state all the way at the tip of the Peninsula Malaysia. The person who invented this must be quite an artist as these crepes are not only tasty, they look almost too beautiful to eat. Roti Jala is a very popular dish during the Muslim fasting month of Ramadan, and is usually served with various types of curries. The mold for Roti Jala though, is not as beautiful looking and almost looks like a cow’s udder. Hah! Here’s a picture. You can find this in local supermarkets easily (and cheap). I bought mine from AEON (Jusco) when I first arrived in KL, what a random buy right? Since this month is Johor month for Malaysian Food Fest hosted by Annie, it’s perfect timing to make another batch of Roti Jala! 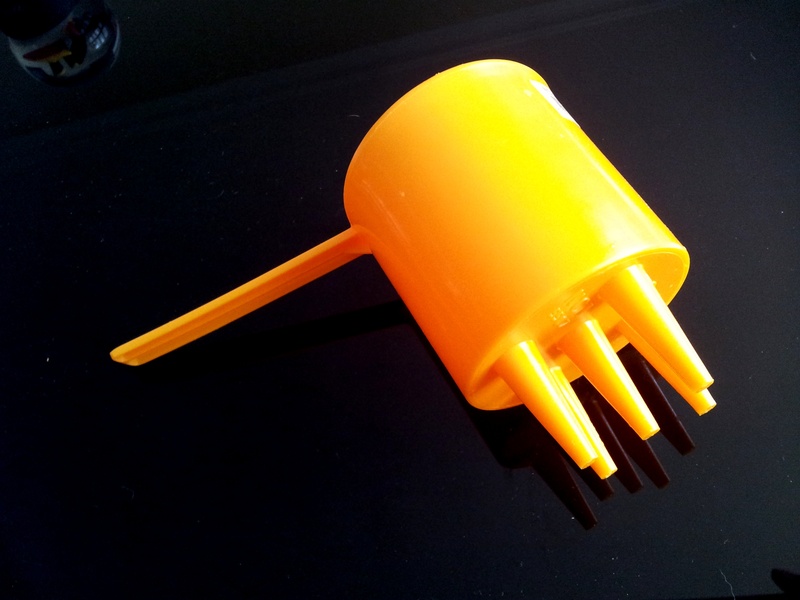 *Note that if you can’t get hold of a roti jala mold, you can punch a few holes at the bottom of a plastic bottle, milk carton, tin can, or just use a squeeze top (this will take longer so turn the heat to low while doing so). In a big bowl, mix everything together (except the oil) and strain, pour into a measuring cup for easier pouring. Turn the heat to medium, grease the pan with oil or ghee. In swift movements, hold the Roti Jala mold above the pan and pour the batter into the mold (it will start dripping straightaway). Start making circular motions to create the ‘lace’ pattern. You might have to readjust the consistency of the batter (with more water) if the batter doesn’t flow smoothly. As you can see, my mold crossed over the middle a little bit too much. Once the top is set (and the bottom lightly browned) fold the crepes into triangles and arrange on plate. The crepes are slightly crispy around the edges and soft in the centre, they are really fun to eat! The best way to enjoy this is with a rich curry with plenty of liquid to soak the crepes. The spices really brings out the delicate flavours of Roti Jala. Since we are always in favour of vegetarian dishes, I’ve made an Eggplant, Pumpkin, Tomato and Potato Curry to go with the crepes. Salt the Eggplant before cooking for about 15 minutes, then wash and pat dry. Roast all the spices in a heavy pan until fragrant. Add oil and saute Onion, Garlic, Ginger, Dried chili for about 10 minutes. Add tomatoes and saute for 2-3 minutes for the juices to release, follow by Eggplant (1-2 minutes), Potato, and then Pumpkin (cooks the fastest so goes in last). Once all the vegetables are nicely coated with spices and slightly browned. Add fresh chili, pour in stock and coconut milk. Cover and simmer for 15-20 minutes, adding water as required. The curry is ready when potato and pumpkin pieces are tender. Just before turning off the heat, stir in the plain Yoghurt and mix well. Serve with rice, bread or the delectable Roti Jala. I am submitting this post to Malaysian Food Fest, Johor Month hosted by Annie of Annielicious Food. Hi Kelly! 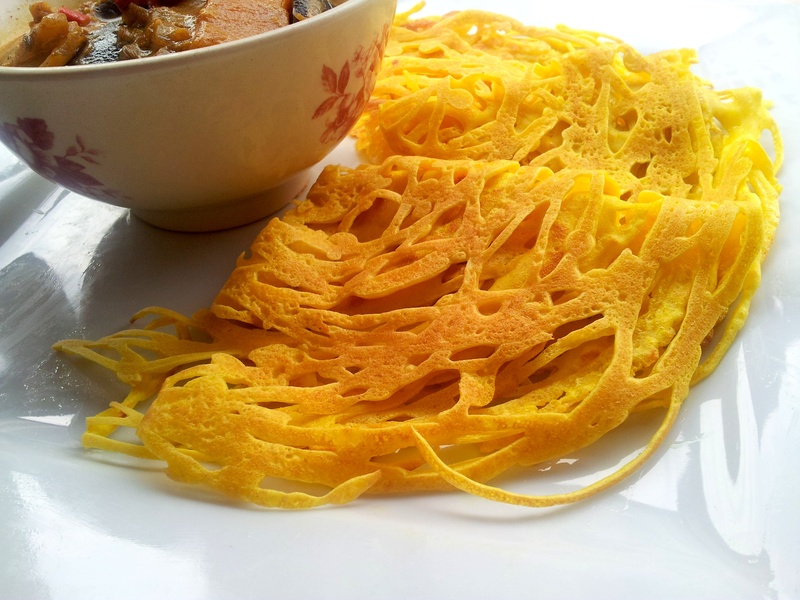 I’ve never tried Roti Jala before but I like what I see… Hmmm, need special mold to make this… No sure if I could get this here. Oh you can also punch a few holes at the bottom of a tin can/plastic bottle or just use a squeeze top. sorry to jump in! I did it here with a squeezy bottle with three tips/holes 🙂 p.s. kelly, this is gorgeous! and I’m so jealpus of your authentic mould! No worries! As long as the end product looks the same and tastes yummy, doesn’t matter what you use! Nicely presented. Simple assembly but nice contrast of colours. Definitely, eating it on its own is pretty bland compared to dip it in delicious curry sauce. Ooooo…I love roti jala!!! Thanks for the recipe. Will try this sometime. Hehe do it soon! 😀 it’s easy once you get the hang of it. Fun too. Looking at your delicious roti jala, I need to find my jala mould and put it to use! Have not used it for a long time! We love roti jala! And your vege curry looks so good! Haha it’s fun to make the roti jala but I admit just a bit laborious. 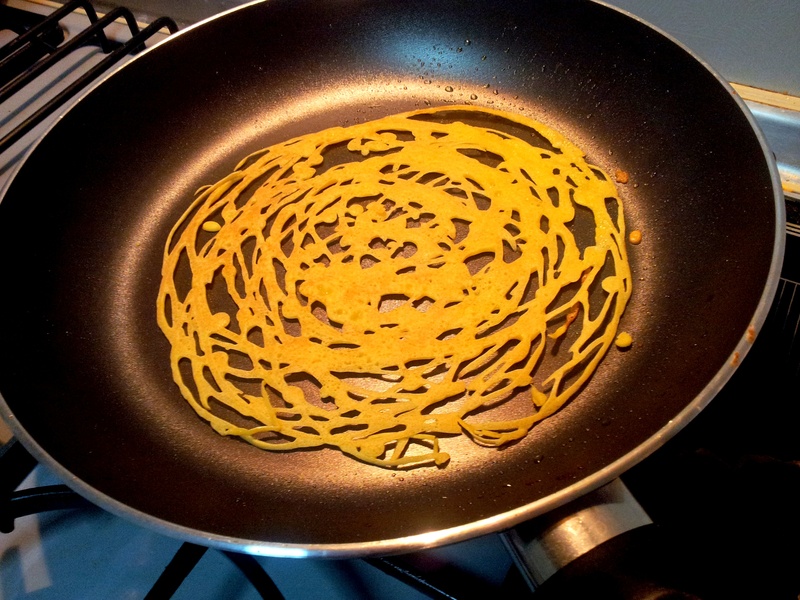 Hehe the locals call it either Lace pancakes/creeps or literally net (jala). I like the word lacy though. Wow….you actually made it from scratch…and it looks darn pretty! Will hopefully make it one of these days. Bought a roti jala mould last year but have yet to use it. No idea why I even bought it then. LOL. Does the Johorean approve? Lol you have to make it soon since you already have the mold. Hehe. One of those random purchases eh? A milk carton? You mean you poked holes at the bottom? Nice to find out about all sorts of adaptations. 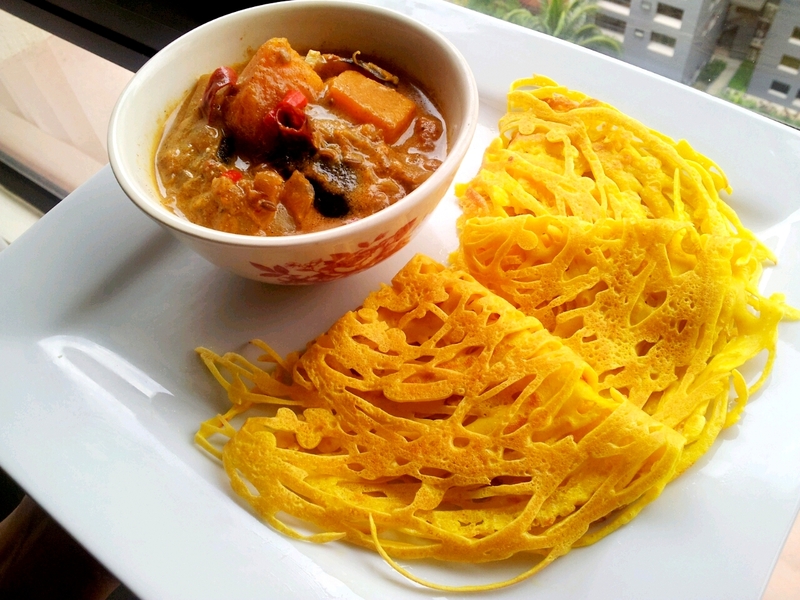 Love roti jala too, perfect with chicken curry! yum! The curry sauce is essential for the whole experience. My other half doesn’t eat Chicken that’s why I made a vegetarian one. Those crepes look amazing, Yummy! Kelly, I love your curry! 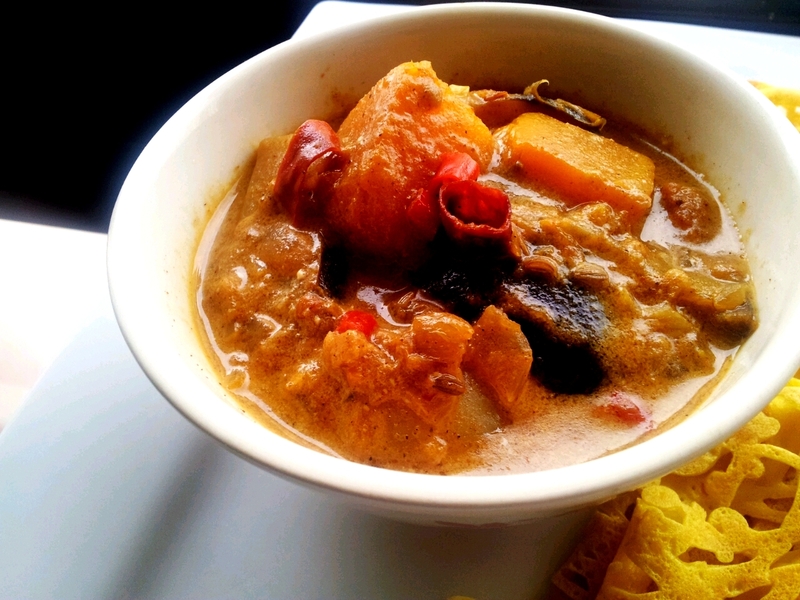 Yeah I love your vegetarian curry too… shd be very nice with the roti jala! At least Frank gobbled his double portion up in minutes! Hi Kelly, nice roti Jala. Beautiful photo too.